Why do experts say that accuracy in weight measurements is vital in baking? Do you think you need a baking scale? What are the critical factors that you need to consider when buying the best baking scales? When you think about kitchen scales, it means you are meticulous when it comes to accuracy. Do you know that there are factors involved when determining the correct weight of your ingredients? Take flour for example. 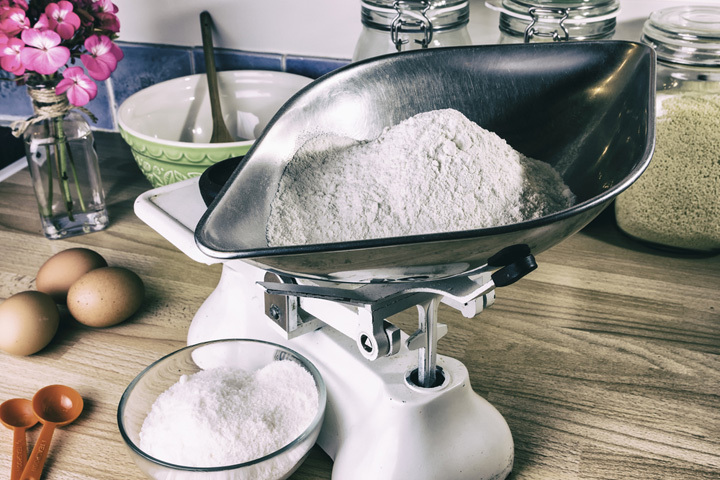 Measurement varies depending on the freshness of the flour, the bulk of the packaging, relative humidity, and even the way you weigh the item. The scenario is just like the comparison of a fluffy vanilla cake and a sponge cake. Hence, with the use of baking scale, for sure, your 500 grams of flour will always be the same anywhere. If you want to be precise, buy a baking scale and give up on measuring cups. Besides, accuracy is not just, what matters. Baking scales can make the mixing process easier and faster. The probability of mistakes is lesser and the time that you consume because of those mistakes is priceless. Come to think of, you also free up yourself from washing the countless cups and bowls that you once used when measuring. Of course, you do! If you want to have consistent quality on your baking products, you really need to use a baking scale. Customers tend to look for the taste that they always long for when it comes to food. Maintaining the delicious trademark of your baking business is important to your marketing. I tell you; even digital scales that cost less are accurate enough for your baking. If you decide to switch, you do not need an expensive investment for a start. However, more sophisticated baking scales can give you “nice to have” features like weight conversions, backlit screen, and pullout displays. Therefore, what do you think you will need? You may go for the most sensitive digital pocket scale or hold on to your current average kitchen scale. 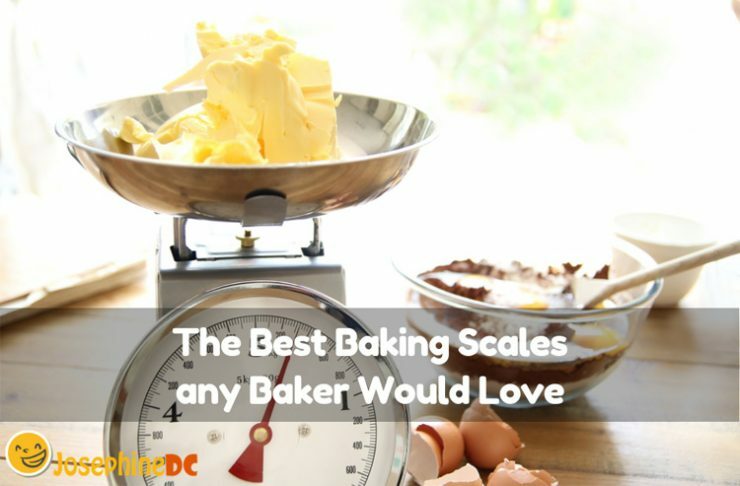 Think it over while I guide you on how to choose the best baking scales any baker would love. If you are contemplating on buying a baking scale, let me help you identify the essential aspects that you need to know about the tool. By then, you can set your priorities depending on your needs. Make sure to point out each point upon making the decision on what to pick. Any baking scale should weigh your ingredients accurately. Try it out first before buying. Remember that the result should be consistent no matter how many grams you are trying to weigh. How do you want to read the measurement? The scale must be able to show you result in both metric and imperial units. Choose one that is comfortable to use. For me, it is easier when it comes in decimals since fractions add on to my confusions. Are you familiar with taring? The scale can subtract the weight of your mixing bowl and shows the result of the ingredient weight only. How convenient it can be! I suggest looking for this feature since it is utmost helpful. How long does the auto-off duration last? Mostly, baking scales have an auto-off feature to conserve battery. However, how long does is the duration before it turns off? Notice that the shortest duration is about two minutes, but some models can last up to five minutes. The longer the duration, the more time you have to do some other important tasks while in the process. I am still looking for a unit that offers the option that we can manually turn off the auto-off duration, I am sure there must be a brand that has it but I just have not discovered. Choose the baking scale that gives result in seconds. Imagine yourself waiting for a while to read the measurement. Time is of the essence. Remember that the best baking scale shows even the tiniest change in measurement the quickest. It gives you the advantage of adjusting right away the amount of ingredient to add. I like my control buttons that have protection all the time. If you fancy a baking scale with laminated buttons, it is better. Besides the fact that it protects your scale from crumbs, grease, grains, and other mess, it should be easy to clean. The digital baking scale is usually accurate for most applicable recipes. It should be fine though, but if you intend to use one that has extra precision, there is always a better choice. With that comes a higher quality product in terms of size and capacity, and more costly at the same time. If you can live with comfort on your current tool, this could be less want for you. You can also buy a milligram scale if you need a precise measurement in less than a gram. In addition, for your reference, whole gram baking scales measure up to 5 kilograms while the pocket type scales is around three kilograms. This probably will not matter much when you are only home baking, but with such features, your scale could be flexible. It would be convenient if your baking scale offers a large space to hold your pan or mixing bowl. I like the kind that has a removable platform so that it is easy and fast for me to clean it. I seldom see it in the market, but if you happen to see one, I suggest grabbing it. Baking scale batteries last a long time particularly if you are only using it at home. However, for a business that bakes huge batches of products, having an AC adapter could be helpful. Whether you seldom bake or every day, consider AC adapter as an option. I know that changing batteries is bothersome, but having an adapter is an advantage. Of course, the non-slip bottom is an additional feature that is helpful when you are particular about kitchen accidents. Having one is necessary for safety. For me, it is a big NO when it comes to glass platform. Glass material is fragile and is prone to breaking. The last I need when baking is the accident of cutting myself and throwing away my ingredients. Besides, they are difficult to clean up and notice that models like this do not have a raised platform, making it hard for me to read the results. If you are technology savvy, baking scales that you can connect to Bluetooth are available too. You can surf on these types, but for me, it is no longer practical to have. Do you think so? The top five products that made through my priority list all hold the reputation of the highest positive reviews from users and sellers. Highly recommended both from moms and professional bakers, the best brands in the market have its own quality and distinctive features to show. I hope that you will find your choice and bring home what you think answers your need. 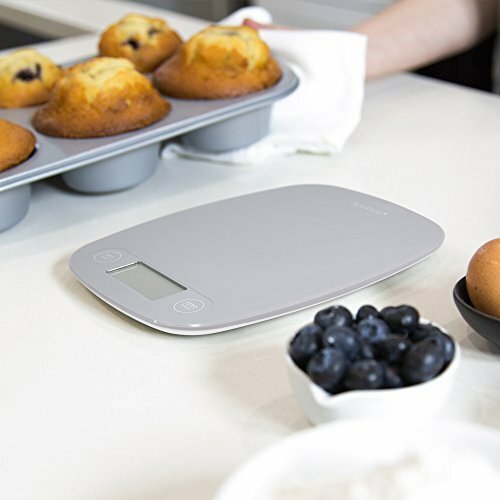 Ozeri model # ZK14-S kitchen/baking digital scale from Ozeri offers accurate results amidst its elegant, user-friendly design. The kitchen scale can accommodate both huge and small baking projects that weigh a maximum of 5 kilograms with precise graduations of 1 gram. It is convenient to know that the automatic unit button promptly converts between five units of measurements. Whatever the unit you prefer (g, lbs., oz., ml) it displays the figures on an easy-to-read LCD screen. Besides, it easily converts grams to pounds, pounds to ounces, and ounces to ml. With its available precision tare button, it calculates the net weight of your ingredients by automatically subtracting the weight of your bowl, pan, or any container to hold the ingredient. It also features a spacious size of the platform that looks elegant in chrome finish, along with two big buttons that generate an audible click information. The fact that it is easy to clean and store is an additional advantage that I really love. The product comes with a trial two AAA batteries that shut off automatically after two minutes to preserve and prolong the battery life. Please note that it works well with Polaroid AAA batteries. The battery compartment is very easy to access during replacement, and you do not need a screwdriver to open it. Auto shut-off is only 2 minutes duration. The platform cannot be pulled out. 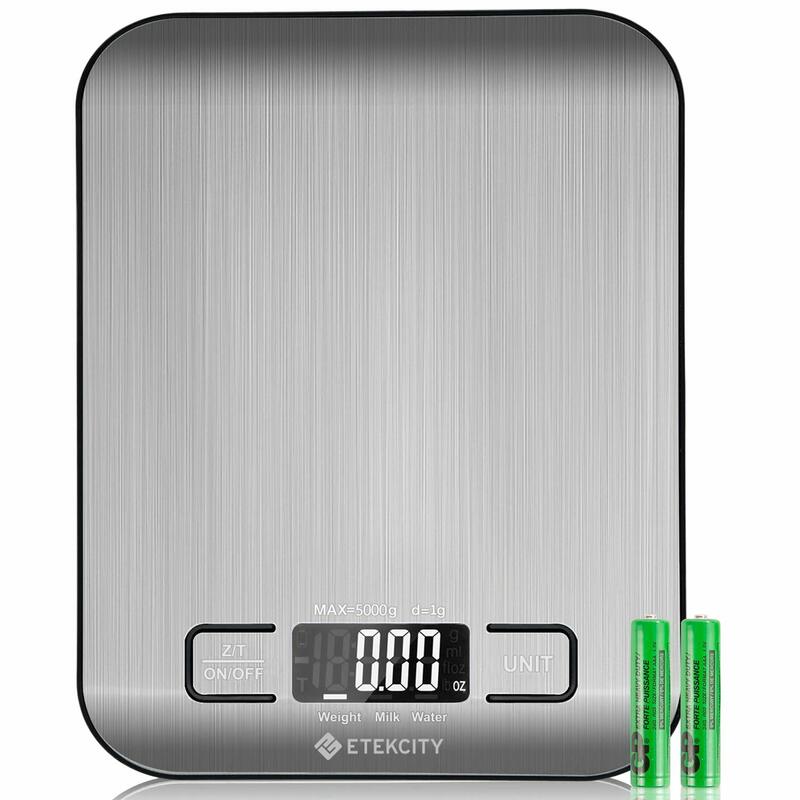 Etekcity offers a digital food scale that is equipped with four high precision sensors for an accurate weight reading all the time. 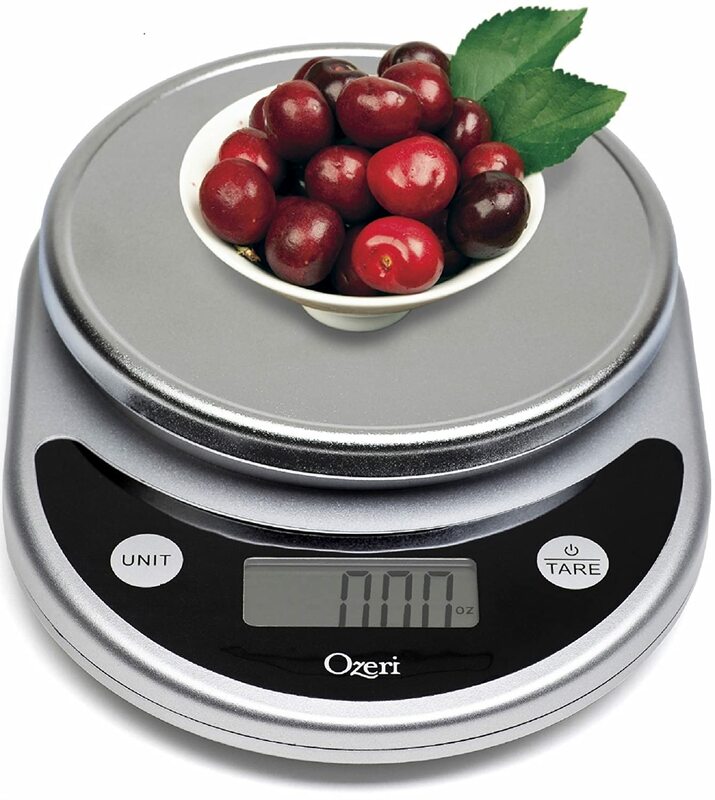 This product is capable of weighing up to five kilograms and is excellent for baking, cooking, postage, and jewelry. You will love as soon as you see the stainless steel platform design that has an anti-fingerprint technology for your easy cleaning and maintenance. The precise tare functions as user-friendly. In fact, you can reset the current weight on the scales to zero; it provides quick unit conversion, volume measurement support, purple backlit display, and low battery indication/warning sign. Expect a more productive baking hour by cutting out prep time. Because it is small, no need to fuss since it can easily be stored and is handy for convenience. Lastly, the scales automatically switches off after two minutes of inactivity. Hence, no need to worry when your hands are occupied and busy that you find it hard to turn off the device. The CE/ROHS certification is good news. It comes with two AAA batteries and a one-year warranty by Etekcity. There are tiny gaps around the buttons where dirt can be stuck. Auto-off duration is just two minutes. 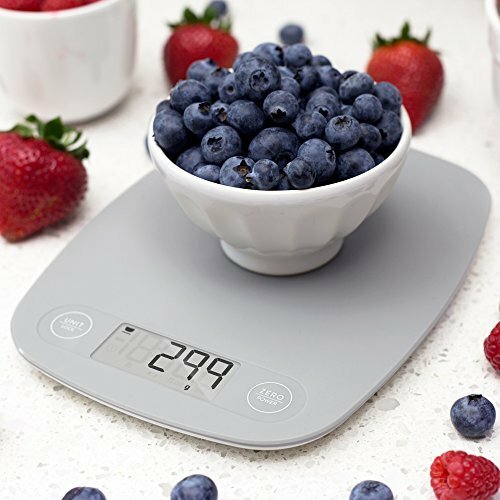 The Greater Goods digital kitchen scale should be the right choice for you when you are looking for an inexpensive baking scale that offers accurate weight reading at the same time. 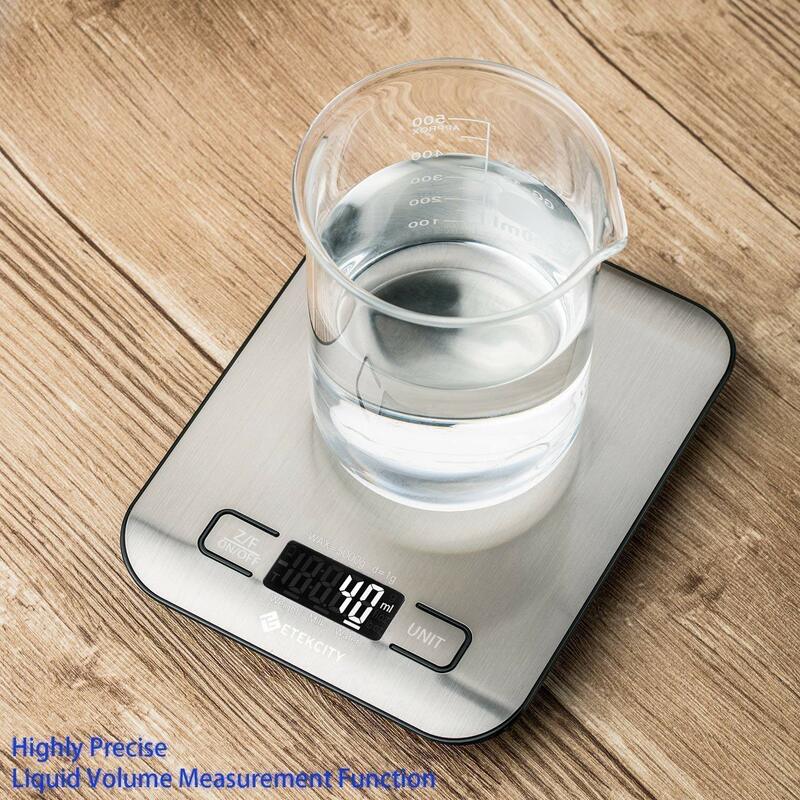 This well-loved product features food scale with one-gram resolution, five kilograms capacity, and is so easy to read the result. The straightforward design focuses on the essential functions that you need during the baking process. The sturdy, smooth plastic weighing surface and hygienic, touch-sensitive buttons are easy to clean. Some features include a high-contrast LCD screen, and the scale shuts off to calibrate itself automatically. Its tare/zero function allows you to measure conveniently and the scratch resistant bottom is a big plus. You can easily switch any unit that is comfortable for you to use without worrying since it has four precision weighing sensors that ensure accuracy. In case you need help, this product is equipped with a manual guide and even a video to make your set up easy. It comes with a battery. Another Etekcity product model, the kitchen scale has a removable bowl, volume room temperature, and timer. The scale capacity is 5 kilograms with a division of 1 gram. Its high precision strain gauge sensors deliver trustworthy results all the time. It also features LCD display for a clear reading result. I say that it is multifunctional because it includes a temperature sensor and an alarm timer for you to accomplish more tasks with less clutter in your baking area. The material construction of the product is of stainless steel material for a sleek and sturdy performance. The detachable bowl good for 2.15 Liters supports for easy mixing and pouring. Its aesthetics is indeed sophisticated and modern, fitting to compliment your kitchen décor. Additional features show a vivid blue backlit display for clear readability in any light setting even with low battery and overload indication. The tare auto-zero function applies to any type of container. The alarm beep is too loud and noisy. 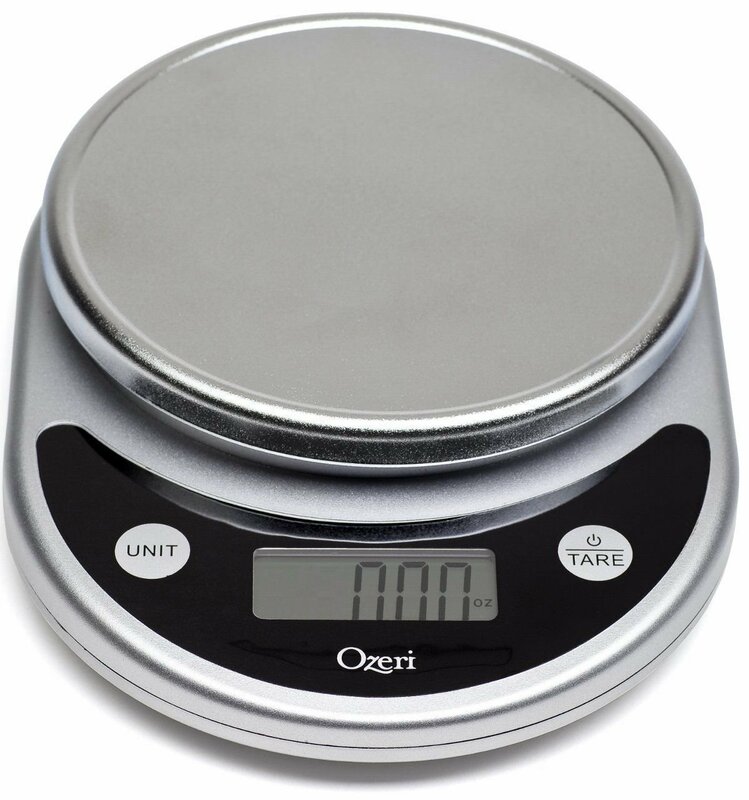 Ozeri is a professional kitchen/baking scale and features touch-sensitive buttons for easy operation and a large LCD screen that displays weights in various units. I have noted that if you can avoid it, never choose a scale with glass platform. However, with Ozeri, the glass surface construction is four times stronger than normal glass. In fact, the model is an award-winning thin design. The available four new high precision GFX sensors, it indeed provides accurate measurements from 1 gram to 5 kilograms. Its precision tare feature calculates the exact weight of the ingredients as well. Two lithium batteries come with the purchase and replacing it is easier than you thought. The best baking scale is the type that can answer all your needs. Did I help you in making a choice? Do not take food scales lightly. Having an accurate measurement when it comes to cooking is a big factor in keeping your food a success. Even the slightest change of ingredient measurement against the correct one will alter the taste and quality of your product. Hence, I encourage you to use baking or kitchen scales for accuracy. Take one step at a time. Even experts recommend using it. Good luck!